Here's a first beta version of Sweet Home 3D 5.2. - a bug that changed the level of walls created from a split. This time, I provide also a Windows installer to ensure that users who have problems under Windows 10 can test the program with the latest Java version 8u66. Yes, bug vanished as far as I can tell. No issues found after a quick test (but had no problems with Win 10 and 5.1 either). Only oddity is that I seem to get US Date/Time format in the Create Photo/Video dialogues (but that may be a Win 10 problem that I just did not notice with 5.1; it is not the only language/locale problem that Win 10 has introduced - the region settings in Win 10 are correct European, btw). Should I try this on my XP machine, or am I to outdated? Great! Are you running the installer or the web start version? Great! That's what I'm currently running. Alas, a few minutes ago I saved a home plan using SH3D 5.2 beta 1 -- and it recursively saved itself. I had just finished adding the latest version of my largest 'furniture' model*; it contains a couple dozen defined materials, of which I remap at least half to a new texture. I know in at least one case I made use of a self-referential texture -- that is, under 'Materials,' I opened a defined texture, selected the existing texture in order to add it to the array of thumbnails, and clicked 'OK'; I then opened another material definition, clicked 'Texture,' and selected the thumbnail I previously added. I have no idea why it chose to save recursively in this instance when in earlier tests with the beta I had intentionally made use of self-referential textures in a model without triggering the erroneous save. After I take a break, I'll return the redefined textures in the recently added model to their defaults and save the project again; with luck, clearing the reference will allow SH3D to store the file correctly. Please let me know if there are any tests or information you need from me. 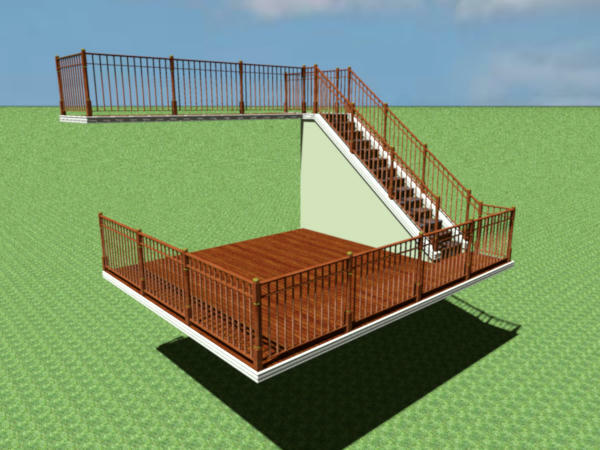 * It models two decks with railings, an external stairway from one deck to the next, a triangular section of infrastructure that serves as walls and ceiling for an interior stairway and support for the exterior stairway, and carved exterior trim boards along the edges of the decks and stairs. I import it as a 17+ Mb KMZ file I generate from Sketchup; however, a single texture accounts for nearly 8 Mb of the total.